A hearing aid is a small electronic device worn in or behind your ear that makes some sounds louder, making it easier for the user to communicate and participate in daily activities. All hearing aids have three basic parts: a microphone, amplifier, and speaker. The microphone receives sounds, which are converted to electrical signals and sent to an amplifier. The amplifier increases the signal power, which is finally sent to the ear through a speaker. Although all hearing aids have the same basic components, the way the components are assembled varies significantly. Some hearing aid styles fit completely in the wearer’s ear, while others are worn over or behind the ear. The style of hearing aid selected is based on a review of the patient’s hearing evaluation, lifestyle, activity level, dexterity, and personal preference. There is typically very little difference in cost between styles. Custom hearing aids fit completely in the patient’s ear. 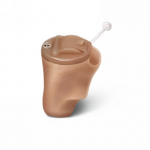 The hearing aid components are housed within an acrylic shell, molded to the wearer’s ear using a cast of the ear canal and outer ear made by the audiologist. Custom hearing aids range in size from the tiny completely-in-the-canal style, to larger full shell models. Custom hearing aids are easy to use with a telephone and offer the convenience of having all of the hearing aid components housed within the ear. CIC hearing aids are most suitable for patients with mild to moderate hearing loss, though there are options available for patients with severe hearing loss. CIC hearing aids are cosmetically appealing, but work best for users with good dexterity and vision, as the components and batteries are very small. CIC hearing aids also lack directional microphones, a technology that has been proven to enhance speech understanding in the presence of background noise. ITC or HS hearing aids are larger than CIC hearing aids, and fit into the lower portion of the bowl of your ear (called the concha). ITC or HS hearing aids are suitable for patients with mild to moderately severe hearing loss, usually have directional microphones for improved speech understanding in background noise, and often have options for volume control wheels. These hearing aids use larger batteries than CIC aids, and are usually easier to manipulate. ITE or FS hearing aids are the largest custom made hearing aids available, and fill the entire bowl of the patient’s ear (called the concha). ITE or FS aids are appropriate for patients with mild to severe hearing losses, use larger batteries than CIC or ITC styles, and are an excellent choice for patients who have poor dexterity and reduced vision. BTE hearing aids are worn either on top of or behind the patient’s ear. For traditional BTE hearing aids, the components are housed entirely outside of the ear and the sound is delivered to the ear using a custom-made earmold or non-custom tubing. 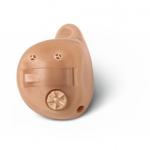 More recently, receiver-in-the-ear (RITE) or receiver-in-the-canal (RIC) models have become very popular. In this style, the speaker is worn in the patient’s ear, and the microphone and amplifier are housed in the device that sits on the outer ear. Nonetheless, all BTE hearing aids have components that are worn on the ear. BTE hearing aids are generally more durable than custom, in-the-ear styles, and are also usually more powerful. Like custom hearing aid styles, BTEs range in size and shape and are generally very cosmetically pleasing. RIC or RITE hearing aids are hearing aids that fit behind the patient’s ear. This style of aid is appropriate for patients with mild to severe hearing loss. Unlike traditional BTE aids, the speaker fits inside the patient’s ear, reducing the size behind-the-ear components. This makes the hearing aid more lightweight and discrete. For patients with mild to moderate hearing loss, RIC or RITE hearing aids are thought to be the most comfortable style of hearing aid, because the size of the components inside of the ear is usually very small. For patients with more severe hearing loss, a custom made earmold can be used to deliver sound to the ear. The tubing for RIC or RITE hearing aids is much slimmer than the traditional BTE hearing aid tubing. Traditional BTE hearing aids are worn behind the patient’s ear, and the electronic components are housed completely outside of the ear. BTE hearing aids vary in size from very small mini BTE styles to larger, more powerful units. BTE aids are now available in fully waterproof models, and sportsman-designed models that are dust and dirt-proof. BTE aids are suitable for patients with mild to severe hearing losses.